The United Nations’ Food and Agriculture Organization estimates that more than 3 billion people lack adequate cooking fuels. (3 billion people is 3,000,000,000 people – nearly 8 times the population of the United States of America.) In developing countries, many people spend as much money on fuel to cook their food as they spend on buying food.Others spend over 40 hours a-week gathering scarce firewood. Total regions have been stripped of trees. Solar cooking has been researched and tested for the past twenty-five years. The Sport is one of the best, low cost solar ovens to come out of this era of research and development. For developing nations that are sun rich and fuel poor, the Solavore Sport Solar Oven can use free sunshine to cook meats, vegetables, breads and cakes and cut down on the need for cooking fires. Countries like Haiti and Nepal have less than 2% of their original forests remaining. Cooking fires pollute the atmosphere at significant levels that contribute to global warming and the greenhouse effect. There are serious health implications. In cooking huts – family members inhale smoke equivalent to 10 or more packs of cigarettes per day. Contaminated drinking water causes one billion children each year to suffer from diarrhea. Of those children, seven thousand die each day. Many people, primarily women and children, suffer eye and lung disease caused by smoke that is inhaled from cooking fires. Budgets are stretched – high percentages of family incomes go to fuel. Kitchens in Zambia are often smoke-filled health hazards to the women and children who use them. “I thank you for the oven I received and I already try it. It is wonderful. I cooked on it wheat and vegetable. The day after I cooked banane (green plaintain) and sweet potatoes. Searching for and gathering firewood takes up to 7 hours a day in some parts of the world. 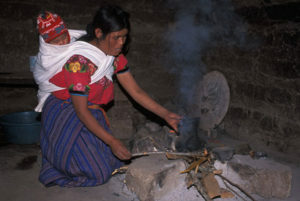 In Guatemala, a woman with her child cooks indoors over a smoky open fire.